Innovation, the conversion of the new to business as usual, is a very special business process. It is the business process able to reprogram all others. Creating the practices that make this process work is a key challenge for all in financial services that are worried about responding to the future. When an institution can identify things that are outside its present practices and convert them, production line style, into products, processes, cultural changes, or new markets, it will never be outpaced by internal or external change again. The institution becomes "FutureProof". This is a book about those practices in banks. It explains, using examples from institutions around the world, what it takes to create an innovation culture that consistently introduces new things into undifferentiated markets and internal cultures. It shows how banks can leverage the power of the new to establish unexpected revenue lines, or make old ones grow. And it provides advice on the social and political factors that either help or hinder the germination of the new in banks. Moreover, though, this is a book about the science of innovation in a banking context. Drawing from practices already highly developed in financial services—managing portfolios of assets to mitigate risk—it explains how practitioners can run their innovations groups like any other business line in the bank one that delivers a return on investment predictably and at high multiples of internal cost of capital. For leaders, Innovation and the Future Proof Bank provides the diagnostic tools to guide benchmarking and investment decisions for the innovation function. And for innovation practitioners, the book lays out everything needed to make sure that converting the new to business as usual is predictable, measurable, and profitable. 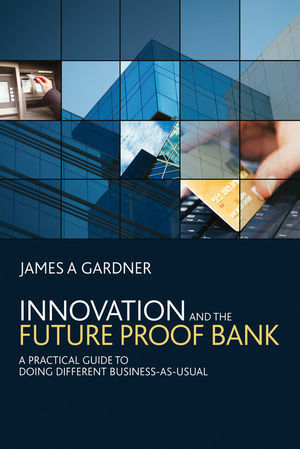 James A. Gardner, (London, UK), is a career innovator that has worked in multiple industries including financial services, technology and the public sector. He is well known in the banking community through his writing (bankervision.typepad.com) and has spent two decades working in and around banking. Originally from Australia, he now resides in London, but spends a good part of eveey year travelling to banks everywhere else. What you will find in this chapter. 1.1 What is innovation anyway? 1.2 What happens when you don’t futureproof. 1.3 Five things that innovation is not. 1.4 150 years of innovation in banks. 1.6 An overview of the futureproofing process. 1.7 Where to go now. 2 Innovation Theories and Models. 2.1 The innovation adoption decision process. 2.3 Innovation from the perspective of the market. 2.5 Innovation from the perspective of the firm. 2.6 Case Study: The internal adoption of social media. 2.8 Case Study: PayPal’s continuing disruption of the payments market. 2.9 Thoughts before going further. 3.1 The innovation pentagram in banks. 3.2 The Five Capability Model of a successful innovation function. 3.3 Case Study: Innovation at Bank of America. 3.4 Building out the futureproofing process. 3.5 Technology, business, and innovation. 3.7 Case Study: ChangeEverything, a project by Vancity in Canada. 3.8 The banking innovation challenge. 4.1 The purpose of futurecasting. 4.2 An overview of futurecasting. 4.3 What futurecasts should innovators be doing? 4.5 Constructing the futurecast with scenario planning methods. 4.7 Case Study: AMP’s Innovation Festival. 4.8 Some final words about futurecasting. 5.1 An overview of the ideation phase. 5.3 Collect, catalogue, and compare. 5.7 Case Study: Royal Bank of Canada’s Next Great Innovator Challenge. 6.1 Should we? Can we? When? 6.8 Case Study: Bank of America and the Centre for Future Banking. 6.9 Wrapping up the innovation phase. 7.1 Ways to manage execution. 7.2 Building the new thing. 7.6 Case Study: Innovation Market. 7.7 The end of futureproofing. 8.2 Things the leaders should do. 8.3 Signs of a bad innovation leader. 9.1 The changing shape of the innovation workforce. 9.2 Creators, embellishers, perfectors, and implementers. 9.4 When innovators go bad. 9.5 A last word about innovation teams. 10.4 Innovation and the organisation. 10.6 The visible face of innovation. 10.7 And finally . . .
11 Making Futureproofing Work in Your Institution. 11.1 Case Study: Civic banking at Caja Navarra. 11.2 Starting your innovation programme. 11.7 Innovation leaders and teams.